"The Huawei P30 gives you that perfect combination of style and substance. With a powerful processor and a large 28 hour battery life, it’s equipped to take on the most draining editing and gaming apps without getting bogged down." How does the P30 look and feel? In three beautiful gradient colours that move as the phone catches the light, the P30 looks as good as it performs. It will get noticed for all the right reasons. If your current phone just can't take a decent image in a low light setting, the Huawei P30 is going to revolutionise your night out selfies. With light fusion sensor technology, you’ll get high quality detail and colour even in dark settings like a bar – so there will be no more blurry, bad quality images. With a Leica triple camera system, you’ll be equipped to take professional-level photos. The 16 MP wide-angle lens makes taking group photos a doddle, without having to squash in. It’s perfect for landscape photography too. What’s going on inside the P30? Fuelled by a Kirin 980 AI chipset, you've got the power to play online games, edit your photos and use even the most draining apps without getting slowed down – the P30 will take it all on, and make it look easy too. If you’re sick of running out of juice half way through the day, the P30 has a huge 28 hour battery life, so even if you forget to plug in before bed you’ll still have enough power left to get you to work in the morning. If 128 GB just isn’t enough for your photos and music, you can add up to another 256 GB – you’ll never see that dreaded “memory full” notification again. What’s new in the Huawei P30? From an improved battery life, triple-lens camera and a new FHD+ dewdop display with new stunning colours, the Huawei P30 is a fashion statement with high spec. It will take incredible pictures in low light with a battery that will outweigh what you expect for such a powerful device. How long does the battery last in the Huawei P30? Huawei is claiming the P30 will last for a whopping 28 hours. Ideal if you’re going to need your Huawei P30 to last all day and then some if you forget to charge it. 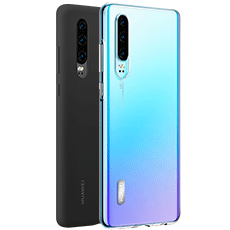 What colours does the Huawei P30 come in? The P30 series really wants you to stand out from the crowd. They’ve got two new colours called Breathing Crystal and Aurora as well as the classic Black with a matte finish around the bezel to give you that nice, classy touch. What’s the camera like on the Huawei P30? With an incredible triple-lens rear camera, the Huawei P30 has a 40 MP sensor, 16 MP ultra-wide and 8 MP telephoto lens. This means you can take pictures at low light and still see the detail you want to capture. So, take it out on your romantic date at dusk or even dancing in the club with your mates and get that perfect picture. The P30 also has a whopping 32 MP front-facing camera so taking selfies or video calls with great clarity. Does it the Huawei P30 have wireless charging? No, the Huawei P30 doesn’t have wireless charging. However, Huawei provide their SuperCharge plug and cable to keep your phone charged with minimal disruption to your day. The Huawei P30 has 6.1 inch screen with a dew drop display. This means you’ve got a whole screen to play with minus the space for that important front-facing camera. It certainly does. This means you can easily use your current headphones or purchase some new ones with a 3.5 mm headjack! Protect your Huawei P30 in style with the official Wallet Cover. Compatible with wireless charging and offering space for your cards and cash, the Wallet Cover is ideal for storing everything you need in one place.